At a time of international incident, the body of a young female staffer is found in a White House wash room. This 1997 movie has benefited from the passage of time. A cast led by two great-looking actors (Snipes and Lane) who give an excellent and credible performance as they go from opponents to collaborators in a plot of high stakes: The U.S. President himself. Wesley Snipes delivers his best combination of thorny charm, crusty persistence and sweaty violence. Diane Lane is beautiful, even when she gets dirty, which she gradually does as the movie progresses to its violent climax. Alan Alda, as the NSC Chair, is excellent, though he presents a tough case when it comes to suspending disbelieve, unless you are one of those handful of Americans who had not watched M.A.S.H. reruns a million times. 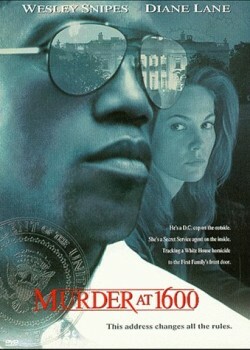 Murder at 1600 is not only good entertainment with a clever, repeatedly surprising plotline, but it raises serious questions about the stability of the presidency, the vulnerability of the president, and the balance of power between the civilian authority and the military, especially in times of perceived threats. This is a very good action movie with a credible high concept that leaves you thinking.